The Santa Monica Eye Medical Group hosts two of the top cataract surgeons in the Greater Los Angeles area. Both Dr. Sadiqa Stelzner and Dr. Rex Hamilton stay on top of the latest developments in the field and make use of the newest technologies that improve patient outcomes. 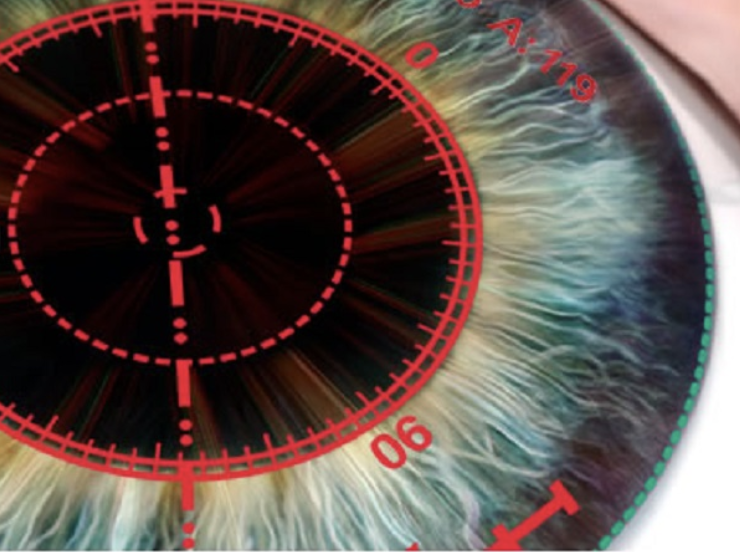 In particular, they make use of two technologies that separate them from the pack, Femtosecond Laser-Assisted Cataract Surgery (FLACS) and Optiwave Refractive Analysis (ORA). Keeping reading to discover what makes these technologies so effective and how they can be used to provide you or your loved one with enhanced vision after cataract surgery. A FLACS system is a device that places very short duration pulses of energy onto specific locations within the eye to perform particular steps of the cataract extraction. “Femtosecond” refers to a unit of time one millionth of one billionth of a second. These pulses of energy can be arranged in a customized way to create a particularly shaped incision through transparent tissues such the cornea (the front window of the eye) and the cataract (the cloudy lens inside the eye). Before using the laser, the FLACS system will collect high fidelity images of the various anatomical structures that make up the front of your eye. 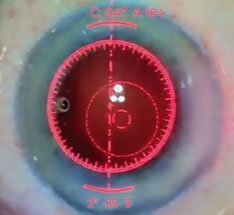 With this image data, the surgeon targets the placement of the laser pulses to create incisions within various structures (such as the cornea or cataract) without the use of physical surgical tools such as a scalpel. This improves the overall accuracy and safety of the procedure, increasing the chance of achieving the outcome you and your surgeon desire. Following the FLACS procedure, Dr. Hamilton will remove the cataract from the eye and place the intraocular lens implant. This is achieved using a system known as phacoemulsification. This technique, developed and refined over the past 40+ years, makes use of ultrasonic energy to break up a cataract and aspirate (i.e. vacuum) it out of the eye through the small, 2.4 mm incision created by the FLACS system. Many steps in the phacoemulsification procedure are still performed manually, however, with either a surgical blade or forceps, without the imaging guidance offered by FLACS. Through imaging guidance, incisions are more precise and reproducible than those made using a manual technique. In order to properly remove the cataract from the eye, precise incisions need to be made to allow surgical tools access to the cataract. In addition, patients with moderate to severe levels of astigmatism may have incisions made to relieve their condition (a procedure called astigmatism keratotomy). With a FLACS system, our surgeons have access to special image guidance software to target the specific locations where incisions need to be placed for optimal astigmatism correction. Using traditional manual techniques, while effective, doesn’t afford the same precision that FLACS does. 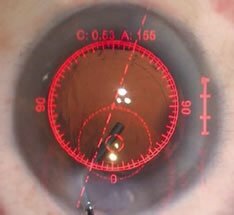 Manual techniques can yield residual astigmatism after cataract surgery, leading to suboptimal satisfaction. The cataract itself is held inside a very thin capsule. In order to extract the cataract from the eye, an opening needs to be made on the front surface of this capsule through a procedure called a capsulotomy. It is critical to maintain the structural integrity of the capsule as it will hold the new artificial lens that will replace the cataract. Normally, this procedure is performed manually and each of our surgeons has done thousands of capsulotomies in their careers. A capsulotomy performed with a laser is substantially more precise than traditional methods, meaning more predictable outcomes and a lower chance of complications. Using a laser provides a more consistent capsular incision and enables faster healing of the lens capsule after surgery. After the capsulotomy has been performed, the cataract is ready to be removed. This is done through a process called phacoemulsification. Using vibrational energy, the cataract is emulsified into small particles which can be sucked up through a vacuum-like device. Phacoemulsification is extremely effective at breaking up cataract, but the vibrational energy can disturb the cornea. While our surgeons are experts at minimizing the emission of excess vibrational energy, some amount of energy can’t be accounted for. Excess energy can increase the chance of blurry vision for a period of time after surgery. Using FLACS, the lens can be fragmented into smaller pieces before the phacoemulsification takes place, meaning less energy needs to be used to break apart the cataract. The benefit of using FLACS for lens fragmentation is typically better vision on day one after surgery in comparison to not having used FLACS. Astigmatism is a condition where the cornea takes on a football-like shape. One meridian of the eye has a steeper curve than the opposite meridian, generating multiple focal points and leading to distorted and blurry vision at all distances. To correct this condition, cataract surgeons may perform a procedure called an astigmatic keratotomy. This involves making one or two incisions at the edge of your cornea, relieving the astigmatism. These incisions need to be made at precise locations, widths, and depths in order to maximize the correction based on the individual’s ocular dimensions. Using a FLACS system with its advanced image guidance software allows for an extreme level precision that is not possible with manual instruments. After the surgeon successfully removes the cataract from the eye, he or she will need to decide which type of intraocular lens (or IOL) to implant to replace the original, natural lens with. Your surgeon will take the necessary measurements and make a series of calculations before your procedure to generate a lens power that maximizes your vision after surgery. However, every eye’s anatomy is unique and error may still be present. When our surgeon use the FLACS system for cataract surgery, they will also make use an additional technology that will refine the IOL power chosen by the surgeon. This technology is called the Optiwave Refractive Analysis system (or ORA) and it allows for measurements of the eye to be taken during surgery after the cataract is removed. Combined with the data gathered from pre-operative scans and our surgeons’ vast experience in treating cataracts, ORA provides a new level of precision that will further improve your visual outcome. Upon removal of the cataract, a patient who is being treated with ORA will see a series of flashing lights. This is the ORA taking dozens of images of the eye over the course of a couple seconds. The computer takes these images, processes them through a series of advanced algorithms, and provides the surgeon with a list of the most optimal IOL power choices. The ORA is also capable of assisting the surgeon with treating astigmatism. If the patient has mild to moderate levels of astigmatism, the surgeon can perform an astigmatic keratotomy to relieve it. With ORA, the surgeon can determine whether there is additional astigmatism correction needed. This correction can be performed by opening the incisions made by the laser. ORA may also determine whether the placement of the incisions is optimal given the anatomy of the eye being operated on. It provides further information to the surgeon so that he or she can make the correct decision regarding your astigmatism. For individuals who have higher levels of astigmatism, a Toric IOL is an appropriate option to treat the condition. It is critical that the Toric lens is oriented properly in order to maximally reduce your astigmatism. The ORA provides the surgeon with an interface to make sure that the lens is oriented properly, drawing a line in his or her microscope to help guide the lens’s placement.